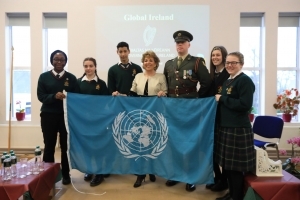 Following the presentation of the JCPA certificates, Ambassador Byrne Nason outlined Ireland’s Aid programme and the plans for ‘Global Ireland’, the importance of sustainable development goals, and how Irish aid programmes around the world touch the lives of secondary school children in the developing world. Lieutenant Billy Scully explained Ireland’s work over the last 60 years as peacekeepers and spoke about the importance of peace-keeping as one of the main contributions Ireland will continue to make as part of ‘Global Ireland’. A Screening of the UN Security Campaign video was followed by a Q&A session with students. This Interactive component allowed everyone a ‘voice’, as the UN allows each member state an equal voice. 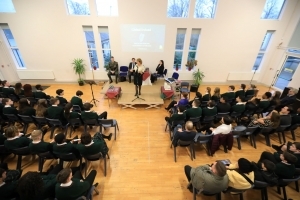 This follows on from previous visits this year from Fianna Fail Education spokesperson Thomas Byrne as well as Helen McEntee – Minister of State for European Affairs.